New Jersey Department of Agriculture marketing specialist Bill Walker delivers a lesson as part of an Annie’s Project program at the Rutgers Agricultural Research and Extension Center, in Bridgeton, NJ. Photo courtesy of Rutgers SEBS/NJAES Newsroom. For generations, the face of farming in America has been the face of a sun-baked, hard-working man. Even with record growth in the number of female farmers, men still make up approximately 70 percent of primary and secondary farm operators, creating a collision course between entrenched gender biases and taboos and the realities of farming’s changing demographics. Annie’s Project, founded in 2003 by University of Illinois Extension educator Ruth Hambleton, is one organization pushing to help the new generation of female farmers and ranchers over those hurdles to access the tools they need to be competent, successful growers, farm business managers, and business partners. 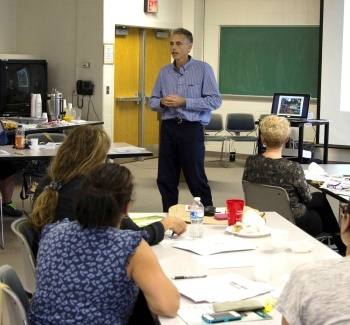 The 18-hour curriculum combines an introduction to the five traditional risk areas of farming–farm risk management, production, marketing, legal, and financial and human resources–with lessons learned by Hambleton in more than two decades of field support. “In my first 25 years of extension work, I listened to the many concerns and requests that farm women had,” Hambleton says. The program also draws on lessons and perspective gleaned from Hambleton’s mother (and the project’s namesake), Annette Kohlhagen Fleck, who lived out her own journey to become an active partner in a farm business. The first Annie’s Project class of 10 women met at Kaskaskia Community College in Centralia, Illinois in February of 2003, funded by a grant from the USDA meant to create a program for underserved audiences. Motivated by the “magical” results of the initial class, Hambleton gathered with other extension educators working with female farmers at a conference that spring. There she met Bob Wells, an educator from Iowa, who thought the Annie’s Project program had merit and could be replicated in Iowa and Missouri. On the strength of that kind of interest, Annie’s Project has evolved into a registered non-profit offering programs in 31 states. Despite its ever-increasing scale and mission, the organization still keeps classes under 25 people and dedicates at least half of each class to discussion. As the organization grows, Hambleton is looking to find a balance between the pace of expansion and resources, such as adequate funding and appropriate host sites. The project’s current model depends heavily on grants and in-kind donations to cover the $300-per-participant programming cost. Hambleton is also exploring options like online platform and weekend classes to improve accessibility beyond geographic barriers. However, these challenges, like the challenges facing female farmers, are most likely to be overcome through the strength of collective movement. In five years, Hambleton hopes the program will have enough funding to at least be self-sufficient, if not also expand to all 50 states and Canada.